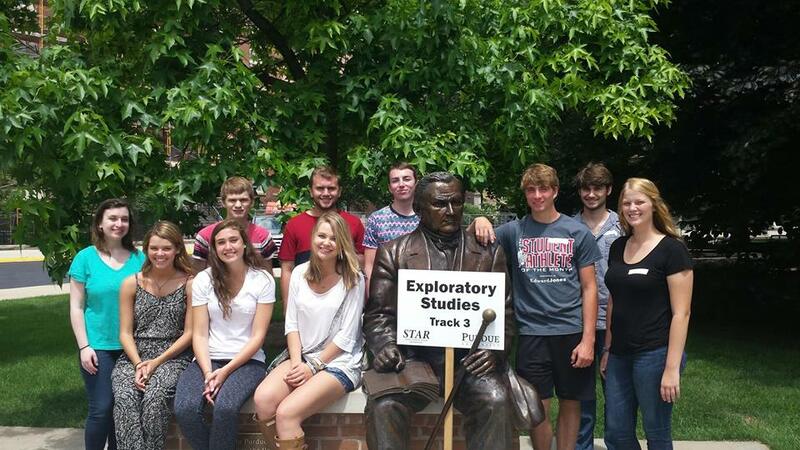 Exploratory Studies at Purdue University will be an exemplary advising program in the nation for Exploratory students. In April 1995, the Purdue University Senate approved a three-year pilot program for beginning, exploratory, undecided freshmen students. This pilot, called the Undergraduate Studies Program (USP), was modeled after a program at The Pennsylvania State University. In August 1996, 212 students started with USP. In February 1999, the Purdue University Senate approved USP as a permanent program for entering freshmen students effective August 1999. In June 2001, the University Division of the Office of the Dean of Students was merged with USP, adding reentry, readmit, and change of degree objective continuing students to the population served by USP. In 2013, USP changed its name to Exploratory Studies. Beginners: 8 semesters of college-preparatory math, 6 semesters of lab science, 8 semesters of English, 4 semesters of foreign language. 6 semesters of social studies. Admission to Purdue is based on a holistic evaluation of each student’s application in the context of the overall applicant pool for Exploratory Studies. Additional Requirements: Transfer students CANNOT have more than 30 graded hours (or the equivalent quarter or trimester hours) of post-secondary college-level coursework at time of enrollment. All transfer students are required to enroll in EDPS 10500 during first semester on campus. To be eligible to CODO into Exploratory Studies, a student must have no more than 83 completed college credits. Credit counted toward completed college credits includes: credit earned by exam, transfer credit, credit earned in P/NP courses, credit for courses in which students earned Fs, and credit for currently enrolled courses. Students bringing into Exploratory Studies 77 - 83 completed college credits should be able to complete the requirements necessary to CODO to a degree-granting college/school/program (CSP) at the completion of one semester in Exploratory Studies. If students can CODO from their current program to the degree-granting CSP they are seeking at the end of the current semester, they are not eligible to CODO to Exploratory Studies. If they end up not being able to CODO to that degree-granting CSP once grades come out, then they can CODO to Exploratory Studies for the next semester. If students have already enrolled in classes for their last semester of eligibility in their current CSP and IF they do well will be able to CODO to their CSP of choice at the end of that semester, they may not CODO to Exploratory Studies just so they can register for the next semester classes. Instead, they should wait for grades to come out and CODO directly to their CSP of choice and then register for the next semester’s classes with their new advisor. NOTE: All students CODOing into Exploratory Studies and are still freshman (going into the 2nd term) MUST take EDPS 10500 “Academic & Career Planning” in Exploratory Studies.